Discover how a simple principle discovered centuries ago in a bath tub can tell us how a ship floats. The science of floatation is simple yet very interesting. You know that every body or object has a volume; that means that if that object is placed on the surface of the water, it will displace water which is equal in volume to the object immersed inside the surface of the water (let me add here that I am using the term water in context of sea and ships, otherwise this principle applies to all fluids). Density of fresh water is normally 1000 kg/m3 and varies slightly depending on whether the water is salt water and some other factors. Now Archimedes tells us that this mass of water displaced actually acts to push the object upward and it causes an apparent loss of mass of the object placed on water by an amount equal to the mass of water displaced. The upward force exerted by this displaced volume of water is known as the force of buoyancy. This force can be assumed to act at a single point on the body which is known as the center of buoyancy of the body. This center of buoyancy is the same as the center of gravity of the part of the body which is immersed in the water. It is this force of buoyancy which keeps the object pushed upwards and prevents it from sinking. So Why Don’t All Objects Float? When an object is placed on water its weight is acting downwards while the force of buoyancy is acting upwards. As the object starts to dip into the water the force of buoyancy would rise. At a point where this force is equal (and of course it is opposite) to the mass of the object, the object stops sinking and starts floating at that position. But if the object is not able to displace a mass of water equal to its weight even after full immersion it will sink to the bottom. Though a ship is made out of several thousand tons of iron (and other materials) it is shaped in such a way that after some amount of immersion in water it displaces a volume of water sufficient enough to counter its weight, hence the reason for floatation. Draft – this refers to the depth from the water surface till the bottom-most section of the ship immersed in water. Freeboard – this refers to the remaining height of the ship above the water level. TPC – Tonnes per centimeter refers to the amount of mass which must be added or removed from a ship so that its draft changes by one centimeter. WPA – Water plane area of a ship is the area which the ship occupies when immersed in water at the water plane. Reserve Buoyancy – a ship is meant to load cargo hence when the ship is empty it must have ample space to take the additional weight of cargo without sinking. 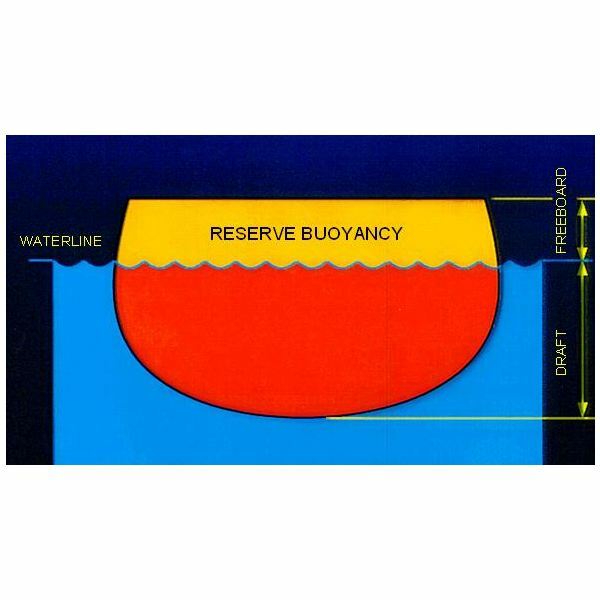 This is known as reserve buoyancy, which is defined as a percentage of total volume.